Yesterday afternoon I enjoyed a quiet moment in the midst of a busy life. 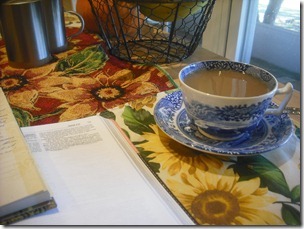 A fresh pot of loose-leaf Chai tea served in my blue china teacups, an open Bible, and a blank journal—these things do wonders to my soul. Everything was still and quiet, and I was able to just talk to my Lord and let Him speak to me. The day was chilly and sunny, and brown leaves covered the ground outside, but I had my seat at our big kitchen window. And with a hot cup of tea and my Jesus, that was all I needed. 81. Precious nieces still safe in their mommy’s tummy. 82. Making a dinner my husband really enjoys (Chicken Fried Steak). And I mean really. 83. Sweet hugs from kindergarteners two days in a row. 84. Slipping into a breezy summer dress after a long, hot day. 85. Wearing said dress on a spontaneous week-night date with my man. 86. Making dinner in my new kitchen for the first time. 87. More cabinet space that I need. 88. Brownies and biscuits perfectly baked in my newish oven. 89. A dishwasher that actually cleans dishes. 90. Enjoying tea and quiet time on a Sunday afternoon next to my sunny kitchen window.